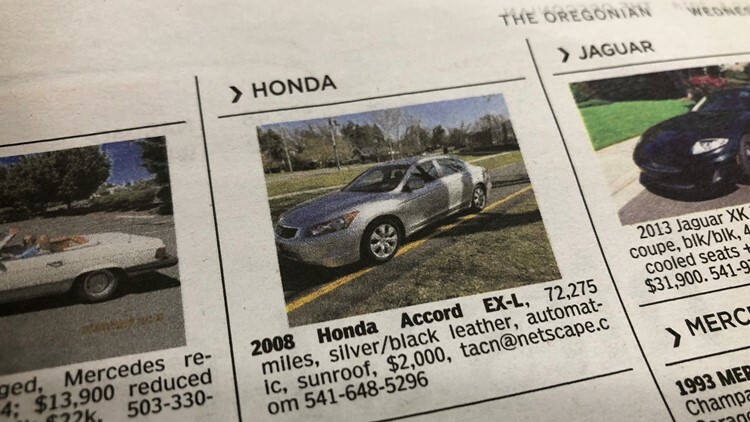 A fraudulent car ad featuring a 2008 Honda Accord is again appearing in Oregon newspaper classifieds. PORTLAND, Ore. — It’s back. A fraudulent car ad featuring a 2008 Honda Accord is appearing in newspaper classifieds. Scammers used the exact same photos and vehicle description to defraud victims two years ago. The advertisement has appeared several times in The Oregonian classifieds. The advertisement described a 2008 Honda Accord EX-L with 72,000 miles, leather interior and sunroof for $2,000. “It sounded too good to be true,” said Jim Maass, who responded to the advertisement. The Oregon man quickly realized the offer was a scam when the seller responded via email. “Right off the bat he starts asking questions about wiring money,” explained Maass. The seller typically replies to emailed inquiries by sending a series of car photos and a vehicle history report. Additionally, the seller writes about a recent divorce and serving in the military. The seller suggests working through a third party to arrange payment and shipment of vehicle. Previous victims explain, once money is wired or a payment is made electronically- the seller stops responding. In 2016, KGW reported a Portland man lost $2,000 to the car scam. An internet search shows the same photo of a 2008 Honda Accord appears in newspaper classifieds across the country. Most of the ads were posted within the past two to three weeks. They all included the same email address. It is not clear who is behind the ads. The telephone number, with a 541 area code listed in The Oregonian advertisement was disconnected. “We employ systems and processes that include both automated and human oversight in the placement of advertising on our platforms,” wrote John Maher, president of Oregonian Media Group in a statement to KGW. Maher explained that scammers are constantly changing their tactics to avoid getting caught. NEVER wire money or use a bank-to-bank transfer in a transaction. CALL the buyer or seller to establish phone contact. If the buyer or seller seems to neglect details agreed to via e-mail or is unable to answer questions about their location or the location of the automobile in question, it is likely to be a scam. ALWAYS trust your gut. If a deal feels “fishy” or sounds too good to be true, it probably is. Plenty of people use online classified ads to buy and sell cars every day. The vast majority of these transactions are legitimate and go smoothly. Losing out on a “great” deal in order to work with someone you trust could save you big in avoiding a possible scam.